Shortly after 1pm on Saturday, November 1st both the Glen Of Imaal Red Cross Mountain Rescue Team and the Dublin Wicklow Mountain Rescue Team were tasked to help a lady with a lower leg injury on Cruagh Mountain. Dublin Fire Brigade were also tasked to assist with the injured woman and while team members were in the area very little assistance was required and the incident was over very quickly. The Dublin Fire Brigade ambulance that responded took the lady to hospital for further treatment. At midday on Sunday, November 2nd, both the Dublin Wicklow Mountain Rescue Team and the Glen Of Imaal Mountain Rescue Team were tasked to help a man who had become unwell while descending Sugarloaf Mountain in Wicklow. 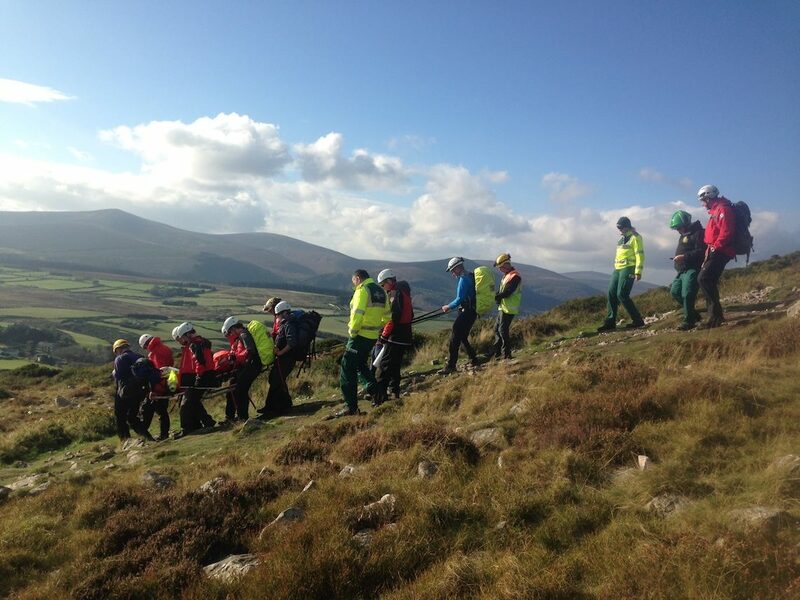 Team members had been training in Wicklow and were immediately able to respond to the callout. A HSE Ambulance Crew were also responding and they had requested the assistance of the Coastguard Helicopter. The man in his 50’s had been out walking with his family when he collapsed but the HSE crew were on scene to help followed soon after by mountain rescue personnel. The Coastguard were available to airlift the man but it was decided to evacuate the casualty by stretcher instead. With over 30 members responding from the two Wicklow based teams they were able to make quick work of the stretcher carry back to the car park where he was transferred to the HSE Ambulance for hospital transfer and definitive care. Thanks to all those who responded and well done to the new probationary members of Dublin Wicklow Mountain Rescue Team who were able to lend their help on their first callout with the teams.